There was a phase when only Galaxies and iPhones were the only powerful devices available in the market. The smartphone market has been evolved over time and there are a ton of brands that offer super powerful hardware at an affordable price. A better processor and more RAM generally means that your smartphone is supposed to perform almost any task you throw. If you are a YouTuber or a person who likes to make videos on his/her smartphone then you may come across a term “Video Editing”. This process is generally meant to be performed on those brawny Workstations and Notebooks. However, our smartphones have become powerful enough to perform all basic video editing stuff. Specifically for Android users, there are innumerable apps available on Google’s Play Store. The second major concern is that which is best for us our viewers as well. A perfect video editing app should be simple, powerful, and easy to use. 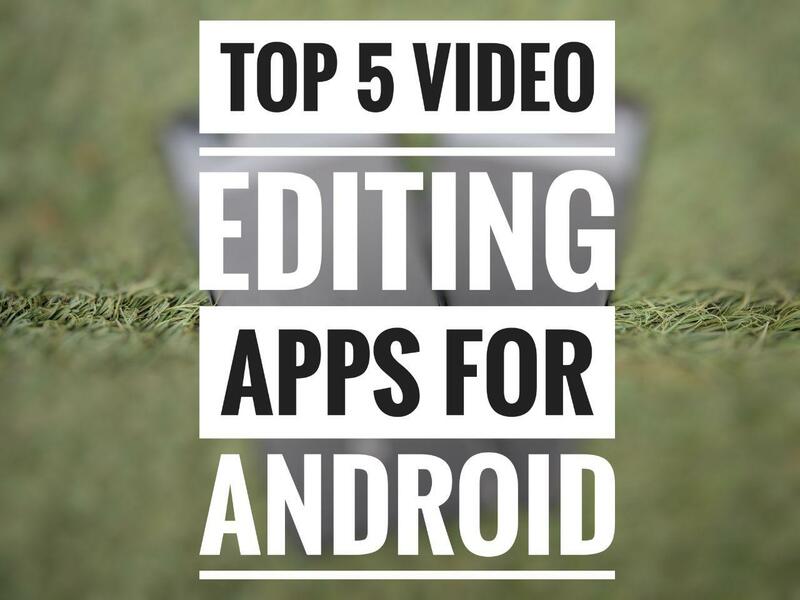 So in our today’s story, we’ve picked some of the best Video Editing applications that are available for your Android devices. Some apps in this list are paid whereas some can be used for free. Action Director is one of the most trusted Video Editing app available for the PC platform for ages. Luckily we have an Android version of the app as well which is a boon for all Android users. The app has been developed by Cyberlink. 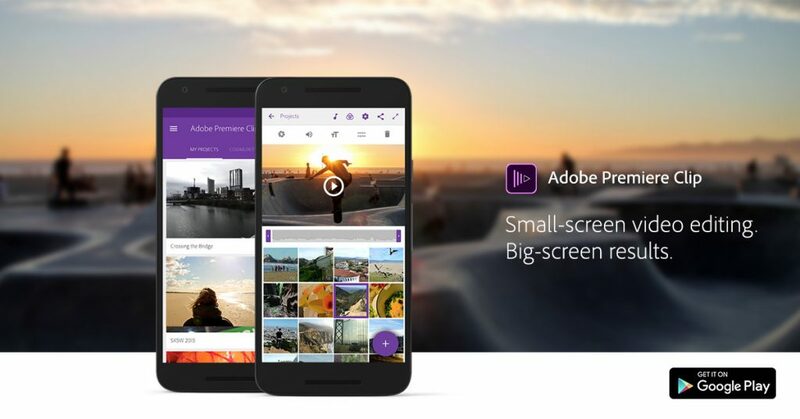 Similar to all major video editing apps you can import, record, edit, share and render videos. You can apply custom music to your videos, add text, adjust speed, trim, cut, etc to make it usable. The app provides color adjustments, brightness, contrast, and saturation controls as well. There are several video effects and transitions within the app that can be applied in a single click. Not many people know that you can even edit 4K videos in it though your device’s hardware should be capable enough. The app is free to download through the Play Store. Adobe is among the big names when it comes to the media industry. In case you guys don’t know they are the developers of some well-known tools like Premiere Pro, After Effects, Photoshop that are being utilized in making films. 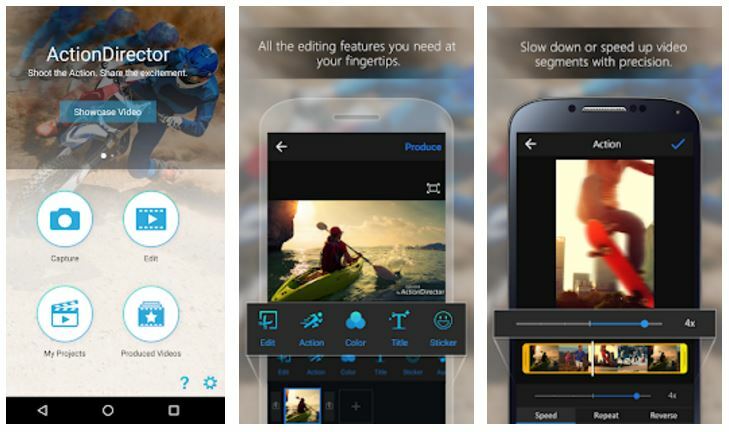 The company offers a cut-down variant of its full fledge video editing app “Premiere” on Android and it is known as the “Premiere Clip”. 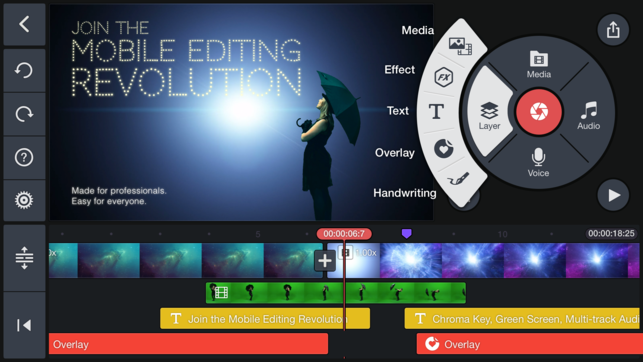 Here you can edit your videos manually using a number of tools, effects, and music. If you don’t wanna spend much time then Adobe also offers a feature called Automatic Video creation which analyzes your images/videos to generate a video file. It offers all essential features including import, trim, cut, add music, sync to music, slow motion, lighting adjustments, transitions, etc. You can share your creation instantly and the best part is it can be used for free. 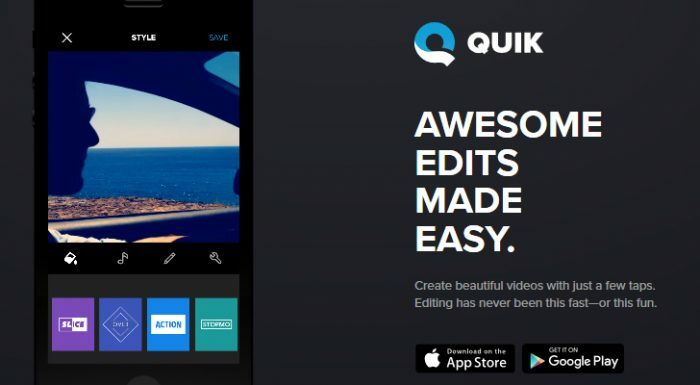 Quik is a well-known app developed by brand GoPro. This app is more inclined towards automatic video creation and is less manual. You can add up to 75 photos or clips in the application to make a brief edit of your files. There are more than 24 presets that you can apply to your files and your photos/videos will be molded as per those presets. You can manually arrange your photos and videos as per the desired sequence. You can add/customize text, add graphics, and filters to make your own style. You can further adjust the duration of any photo or video. Adjust the speed of your video and make it slow motion. There is a gallery of more than 100 songs from which you can choose the desired one. You can render your videos in 1080p as well as in 720p resolution. The app is luckily free to download through the Play Store. The original app was developed by Wondershare and is available for Windows platform from ages. The Android app is also available but it will limit the features compared to the PC version. Filmora is a well-established name and is also one of the easiest video editing app in our list. You can perform all basic things including import, trim, cut, render, etc. The app also comes with a feature that can make your video play in reverse motion. FilmoraGo provides a different aspect ratio to render a video including the 1:1 for Instagram and 16:9 for YouTube. 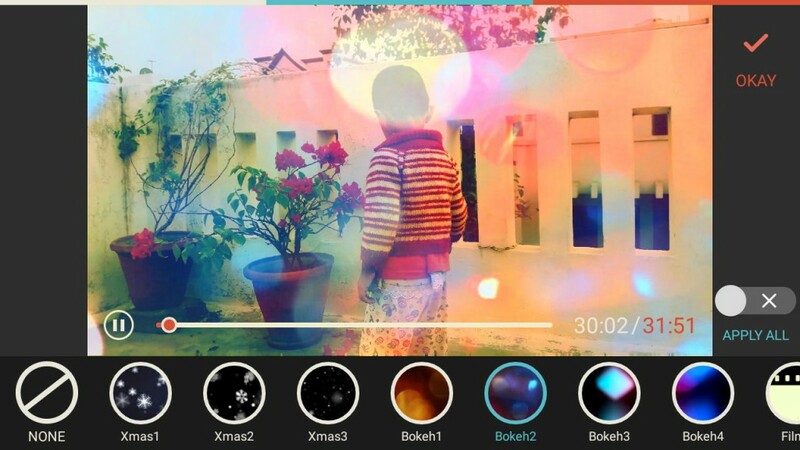 The app offers in-built transitions, effects, filters, titles, themes, etc to apply. Directly from the app a person can share his/her creation or simply the file can be saved to the gallery. The app is free to download, however, in-app purchases are there. Kinemaster is one of the most popular and layer-based applications that lets you control your media further. You can perform all essential functions including cutting, trimming, multi-track audio, color LUT filters, 3D transitions, etc. Undoubtedly it is one of the most advanced video editing application available for mobile devices. Additionally, the app offers Chroma Key(for green screen removal), audio filters, etc. The app is more powerful and a little typical to understand compared to other apps in our list. You can’t compare Kinemaster to a full-fledged PC application, however, it gets the job done. It offers a ton of animation styles, speed control for videos, volume envelop, real-time video recording, etc. The app is free to download in the trial version, however, to gain extra control you need to purchase it. Next articleWhat all we know about the OnePlus 6T: Specs, Price and More!